An eight-speed automatic gearbox, a streamlined and innovative exterior design, and a fuel saving stop-start system that cuts the engine off when appropriate (like at the traffic lights or at road-works). These are some of the nice little improvements over the outgoing BMW 5 series models. Sitting inside the new BMW 5 series is a superbly comfortable and very stylish experience. Fresh and innovative design has also crept into the mid sized Beemer’s interior with a new heads-up display. Some of the options available to the new BMW 5 series buyer are sportier gearbox shifts, active anti-roll bars, active steering, self-parking aids, a surround camera system, collision warning, night vision and pedestrian recognition. All that’s left for me to say is that these are a bunch of new BMWs that you are going to enjoy driving! So you’re looking for a new car. You want something that’s big enough to take your family, and is reliable and safe. You also want a car that’s got the performance and handling that will make it a satisfying car to drive, and you want something that looks good. The BMW 5 series is the benchmark by which other cars of its type (executive) are judged. But does it fit the bill for you? First of all, the BMW 5 series is certainly a safe car, earning (appropriately enough) a five-star rating in the EuroNCAP crash tests. The driver and his/her passengers (up to four) all have the three-point pretensioned seatbelts and head restraints that are vital in today’s cars. The driver and passenger front airbags have occupant sensors and multi-stage deployment, and the front side airbags also have occupant sensors. The active safety features are also impressive, featuring four-wheel ABS with a brake assist system and cornering brake control, stability control and electronic traction control. These active safety features work together to give the BMW 5 series excellent stability, cornering and road-gripping ability – plus the ability to stop in a hurry if a none-too-bright dog decides to chase cars smack in front of you. The BMW 5 series also has plenty of room to seat five people comfortably, although leg room in the rear seats may be a little tight. However, having ridden for a hundred kilometres or so in the back seat of a BMW 5-series, I can say that the legroom seemed perfectly adequate for me (maximum is 36 inches). The comfort of the driver and front passenger are also enhanced by bucket seats with five adjustments and a centre armrest. Entertainment is another consideration if you have to transport children. Once again, the BMW 5 series will keep everyone happy, with ten speakers channelling whatever music you choose to play over the MP3 compatible CD player (probably The Wiggles in my family). Pop-up cupholders front and back mean everyone can have a place to put a drink down without much risk of spilling lemonade all over the leather-look upholstery. Tinted glass throughout the cabin will keep everyone shaded on a boiling hot day. The front seats have a pocket in the back so children in the back seat have a place to stuff books, and the reading lights at the back mean that they will be able to read them at night. The 5-door wagon variants of the BMW 5 series are excellent for carrying gear. 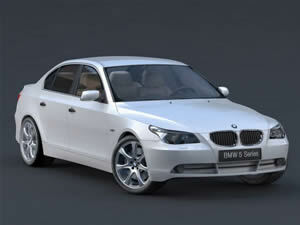 Adult members of the family, however, will be more interested in how the BMW 5 series performs. A range of variants are available, both in body style, engine size, and transmission (automatic, manual and semiautomatic, all six speed). All BMW 5 series engines deliver smooth responsive power. And the more powerful engines are more than capable of pressing you back into your seat under heavy acceleration. As already mentioned, stability, and grip in the BMW 5 series is excellent. And last of all, the BMW 5 series looks good. The exterior is both shapely and sizeable, while the headlights have a quirky shape that gives the car an expression of focus and determination – it’s nice to see a modern car that has some personality to its looks. The interior is also manages to blend the retro-styled analogue speedo and rev counter with modern lines and ergonomic buttons to make a harmonious whole. The BMW 5 series is most definitely a car that will please all members of the family, whether they’re concerned with safety and practicality, or with performance and good handling. Even the kids will like it, both the looks and as a place to ride in. For any more information on the BMW 5-Series, or for that matter any other new car, contact one of our friendly consultants on 1300 303 181. If you’d like some fleet discount pricing (yes even for private buyers! ), we can submit vehicle quotes requests out to our national network of BMW dealers and come back with pricing within 24 hours. Private Fleet – car buying made easy!